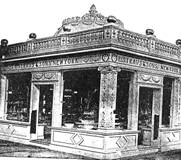 In July and August of 1893 the Jeweler’s Circular had a series of articles on the Straus glass exhibited at the exposition. So that you can get a flavor of the time period, these articles are being reproduced in their entirety. The illustrations are provided for emphasis. 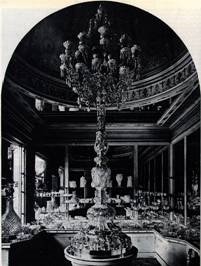 “Having inspected and appreciated the beauties of the exterior of the World’s Fair pavilion of L. Straus & Sons, 42-48 Warren St., New York, in which they make their exhibit of cut glass, the writer and the reader will in imagination enter the booth and pass judgment upon its decorative effects and contents. The interior has the same general color effects as the exterior, namely white and gold, with the exception that the tables are laid and the walls wainscoted with mirrors. The shelves are of plate glass upheld by gilt brackets. From these details it may be inferred, when the nature of the articles displayed is borne in mind, that the ensemble in its brilliancy and beauty reminds one of the jeweled palace of Aladdin. Caption: Interior Of the L. Straus & Sons Exhibitat the World’s Fair. Entering at either door the visitor is entirely surrounded by cut glass. Salient in the center of the pavilion rises from a platform a cut glass electrolabra 12 feet in height. The stand is 2 ½ feet high, and thus this marvelous example of handiwork ascends approximately 15 feet from the floor into the dome above. This piece is the chef d’oeuvre of L. Straus & Sons’ cut glass exhibit, and we venture to say that there is nothing in its line in the great Manufacturers building that excels it from any standpoint. No individual piece in the building attracts more attention from visitors, who marvel at the magnitude of the undertaking in producing a work of such size, elaborateness and artistic beauty. The reader will appreciate the foregoing assertion when he considers that the electrolabra consists of from 1,300 to 1,400 individual pieces of glass of various shapes and all richly cut and highly polished. The pieces are held together by a thin frame of metal silver coated, so that the entire work appears to be of glass, the surface of the frame coinciding with the color of the glass. The cutting is in Straus’ Americus pattern, a brilliant and tasteful design which admirably lends its beauty to such a work as the electrolabra. The candelabra portion of the piece consists of thirty arms each holding a sixteen candle power lamp; in addition there are twelve arms for ornamental purposes. These arms are hung with richly cut bells, chains, pendants, rosettes, and other devices or attachments, all of novel shapes and exquisitely executed. The base of the piece is a wonderful piece of work in itself. It is three feet in diameter, the decorative effects in the cutting being deep grooves, thus bringing the details of the various designs in high relief. While the layman may consider that this portion of the piece shows less elaborateness of workmanship than the upper portions, the connoisseur will comprehend the great amount of study and labor expended in its production and pass the highest encomiums, upon it. The candelabra is lighted up. The electrolabra, it is admitted, is the largest article in cut glass ever produced, and is one of the pieces de resistance of the Manufactures building. Yet the surrounding articles are equal in artistic effect. Especially striking to the mind of the visitor is the great originality both as to shapes and to designs in cutting disclosed by the exhibit. Though cut glass, it may be safely asserted, admits of versatility of idea as to the cuttings, it does not as to the shapes; and we are used to see the same shapes produced by different manufacturers, at least they appear to be the same at the first glance. It is the policy of L. Straus & Sons to conceive entirely new shapes which they protect by design patents. Caption: Columbus Egg punch set. L. Straus & Sons’ Exhibit. 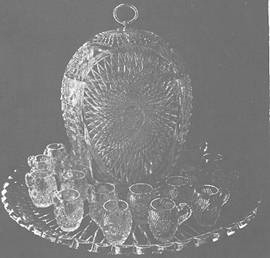 “One of the larger pieces shown in the exhibit of cut glass of L. Straus & Sons, 42-48 Warren St., New York, at the World’s Fair is the Columbus Egg punch set, which, though smaller than the wonderful electrolabra and the beautiful epergne described in THE CIRCULAR of Aug. 2, is nevertheless among the most interesting pieces of the display. As the name indicates, the shape of the bowl is that of the fabled egg with which the great discoverer is supposed to have taught the Spanish savants a lesson in sharp practice. The punch bowl rests on its smaller end on a large platter, 26 inches in diameter, surrounded by two dozen punch cups, similar in shape. The cutting throughout the set is in the new ‘Columbus’ pattern, which consists of a beautiful combination of ovals alternately filled in with stars and double cut hobnails and is very elaborate in detail. The shapes lend themselves effectively in bringing out the richness and brilliancy of this beautiful design. A careful examination of the workmanship expended on the bowl and platter shows them to be among the remarkable features of the exhibit. One of their chief characteristics is the thickness of the glass which is far greater than is customary in pieces of this kind. So heavy are the pieces that it required four men to hold the platter alone during the process of cutting. With such perfection does the pattern continue from the body of the punch bowl to the cover, that when the cover is on it is almost impossible to perceive the line of separation, the piece having the appearance of a solid egg of cut glass. Coming to the smaller articles, those of ordinary size, the visitor is confronted with a variety which is veritably confusing. In salad and berry bowls alone he sees one of the greatest assortments ever brought together. Originality in shapes seems to be one of the strong points in the product of this concern; they are not copies even in the slightest particular, but are wholly original and unique. Before closing this article, mention should be made of a decanter, the size of which alone makes it an object of exceeding interest. It stands over 40 inches high and is believed to be the largest decanter ever cut. The stopper which is a beautiful example of lapidary cutting, weighs over thirty pounds. Few who see this piece can appreciate the difficulties and expense attending its manufacture, two similar bottles being broken in the cutting before this perfect one was obtained. Who originally purchased the Straus World’s Fair cut glass? “L. Straus & Sons sold this week the largest article of cut glass ever produced. It is an electrolabrum, standing eleven feet eight inches in height, with a diameter at the base of two feet nine inches. It has thirty arms for electric lights, and twelve arms for ornament. The base and trunk consists of thirty-nine large pieces of cut glass, held together by metal work, which, however is not visible. The ornamental parts, such as chains, pendants, rosettes, etc., consists of 1,329 separate pieces of cut glass of many sizes and shapes. It took twelve men forty-five days to make it, equivalent to one artisan working 540 days. Where is the Straus World’s Fair cut glass now? Milton Hershey, known for his chocolate products, was the “gentleman” who bought the lamp. He used it in his home in Hershey, PA, where a circular aperture in the ceiling of his entry hall suggested the lamp’s setting at the Exposition. Mr. Hershey bequeathed the lamp, along with most of his estate, to the Milton Hershey School. It is now on permanent loan to the Hershey Museum. A report providing the selling date and identifying the original buyer for the epergne has not been found. However, the epergne was sold by Christies’ London Auction house in 1990. It is now located in Japan. The whereabouts of the Egg of Columbus punch bowl purchased by a “Philadelphian” and the other pieces of Straus World’s Fair cut glass remains a mystery to this day. Straus was proud of winning six awards for their cut glass. Many Straus ads, such as the one the one shown below, mentioned the World’s Fair awards. appeared in the September 1894 Harper’s Magazine Advertiser. Courtesy of the Author. All of the glass for the World’s Fair was cut at the Straus Jay Street factory.